Over the years, the team at Rebellion have made quite the name for themselves, and after propelling to success with the iconic Sniper Elite series and continuing that with quality content updates for each and every title, there has been very little to complain about when they are at the helm. This year though they changed things up. Instead of a new Sniper Elite title, we were treated to the rather delightful Strange Brigade, and after a decent showing in the first part of the three-part mini-campaign, it’s time to take a look at the second chapter of The Thrice Damned – The Sunken Kingdom, if only to see if the same level of quality has been maintained once more. So, after a trip out to the Isle of the Dead last time around to recover a mystical shield, the latest trek changes things up once more with players now setting foot in the depths of underground caverns. 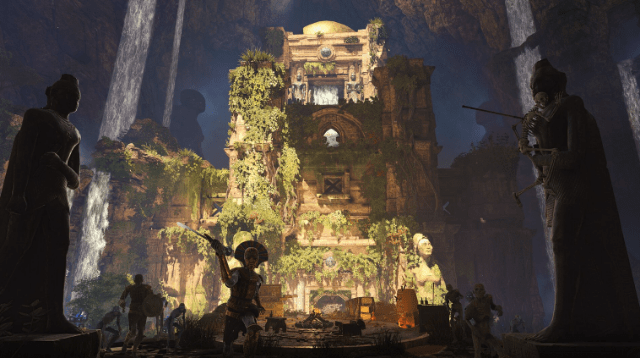 The Sunken Kingdom is said to harbour the second vital piece of the shield the Strange Brigade are so desperate to get hold of. 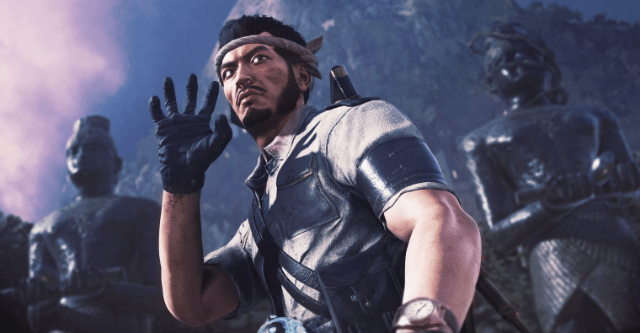 As with the first DLC, the latest addition is comprised of just one level for players to get stuck into, but it does also come with yet another all-new playable character in the form of Japanese Naval Officer Hachiro Shimizu, and a couple of new weapons including the Mikhailov 38-rifle, the Marchador TT pistol and the Shock Grenade. There is also another amulet power included, with the Decaying Demon Blast proving an exceptional addition to those already available. As you’d expect though it’s the level itself which takes pride of place here and much like the rest of the game it’s a marvel to look at. The finely crafted setting brings out the intimate details of the claustrophobic cave systems that make up the level this time around, and so there is always something you’ll be gazing at as you pass through the surprisingly lengthy level that is home to numerous deadly bugs that wish to bring about a premature end to your efforts of hunting down The Sunken Kingdom. Whilst the enemies are as ruthless as you’d expect, should you have already played the rest of the game, there isn’t anywhere near as much variation this time around. In fact, many enemies are repeated which makes it all feel a little predictable as you progress. One reason for that of course may be due to the much more confined play area this time, but it would have still been a bit better to have something else besides an overgrown bug infestation to battle away at. Thankfully the puzzles are once more absolutely fantastic, leaving my very basic puzzling knowledge searching for the answer that was right before me at one point, whilst the deadly maze that appears at another point also proves to be a clear highlight. Gameplay wise and well, what can I say that we didn’t already know – it all very much plays out like the base game, and whilst that’s certainly not something you’ll find us complaining about, anyone hoping for something a little different to shake things up won’t find anything special besides another level. The Thrice Damned 2: The Sunken Kingdom is certainly not going to disappoint though, with some fresh additions in terms of puzzles, tougher battles with some crafty enemies and yet another perilous adventure on offer as you and the rest of the Strange Brigade head out to capture another piece of the shield you so desperately need. As for the additional character, and it must be said that Hachiro Shimizu is another basic addition. He does come with a rather fascinating melee attack, with his high kick making me chuckle on numerous occasions, but he’s not exactly a spectacular addition to the crew. That said his default weaponry consisting of the newly added Mikhailov 38 rifle is one that I quickly began to adore thanks to the sheer power output when taking down enemies, although the ridiculously slow reloading and rather disappointing firing speed will certainly put some off. The most memorable part of our new-found hero though comes from his new amulet power – the Decaying Demon Blast which once used creates a devastating line of spikes that rip through most enemies; it is a fantastic weapon/power to use when surrounded by a crowd. The shock grenade that he comes with isn’t bad either, sending an arcing electric bolt between grouped enemies. 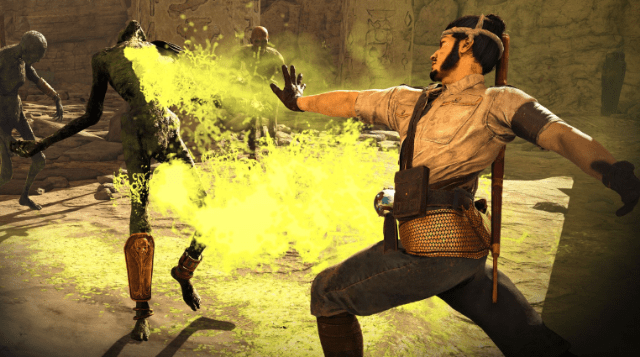 Overall and if you’ve enjoyed the first piece of DLC for Strange Brigade or just want more than the base game, then there is nothing here that would dissuade you from a purchase. Unfortunately, there is equally nothing spectacular should you want something a little different, but The Thrice Damned 2: The Sunken Kingdom is still another reasonably strong showing from Rebellion and the Strange Brigade.